It never fails. 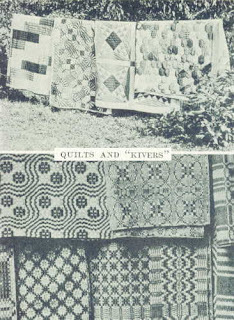 When some urban writer is reporting on quilts, he/she presupposes that quiltmaking is an almost-dead craft, Anyone who quilts must be a very, very, old lady. Dear reader, are you feeling your age yet? The photo to the left was from a 1929 issue of National Geographic magazine. We were already antique then! Fact is, quilting may be one of those Alzheimer-deterrent activities. Also in that classification are chess, playing a musical instrument, knitting, and doing crossword puzzles. Quiltmaking seems to access both sides of the brain. It's good mental exercise in other words. We knew that! Young sewers are coming into quilting in a big way but at their own pace and style. Call it 'cupcake sewing.' Just as the ingredients of cupcakes are the same as those of a large cake, so young sewers are making beautiful little objects, one mini-masterpiece at a time, rather than attempt a full-size quilt right off. 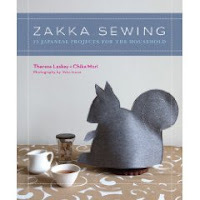 The Japanese have a word for it: Zakka. The word literally translates as "household objects" but it's come to mean small, easy to do sewing projects that are both useful and beautiful. One book, published not quite a year ago, has unleashed the floodgates for zakka-minded sewers. Although I got into making monster quilts right away (obviously I had something to prove) now I'm coming to appreciate the 'small jewel' concept. Now if my nieces and nephews would just accept a beautiful potholder instead of that bed quilt!